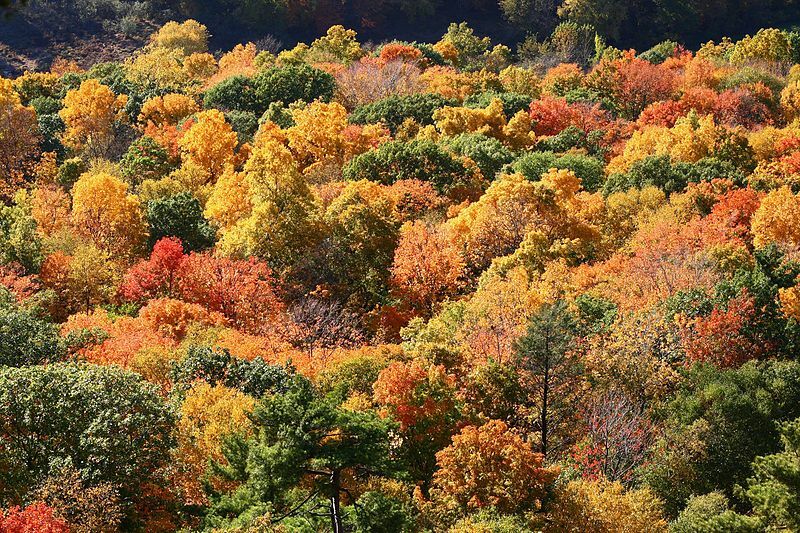 Leaf Peeping: Where to See the Best Fall Foliage! Leaf Peeping is an informal term used in the United States for travelling to view and photograph the changing colors of the leaves in the fall months. Travelers observe the "fall foliage" when trees' green leaves take on many colors that range from red to yellow in the autumn season. Typically, the farther north you are in the U.S. the earlier the leaves will begin to change colors. Similarly, leaves at high elevations tend to change colors earlier than those at lower elevations. New England has some of the best locations for leaf peeping in the U.S., and we've included some locations below for you to consider. Route 100, Vermont: This route winds through the Green Mountains from Massachusetts to nearly Canada. While enjoying all the changing colors, there are also sugarhouses and general stores along the way where you can pick up some delicious treats. You can also go up by Wilmington and even Weston, which is home to the Vermont Country Store or consider ending your trip in Waterbury Center where you'll find Cold Hollow Cider Mill and their famous cider donuts. Southern Vermont, Route 7A: Route 7A is a great place to start your leaf peeping. There are many roads that intersect with Route 7A that will lead you to other great sights such as Route 108 and Route 9. On Route 108 you will also find Stowe Village and Smuggler's Notch State Park, a great place to relax and have a picnic. Vermont has been known for some of the best fall foliage around. Dartmouth-Lake Sunapee Region, New Hampshire: You can start your journey in Claremont, NH. Route 12A goes along the Connecticut River and is known for its old barns and covered bridges. From here you can pick up Route 11 and head east to the scenic Sunapee Lake or take a ride to the top of Mount Kearsarge at Rollins State Park in Warner. Kancamagus Scenic Highway, New Hampshire: This is a mountainous route that rises to nearly 3,000 feet as your drive. You can start in Conway, NH and end in Lincoln, NH. You will find many great photo opportunities: alpine and valley panoramas, covered bridges and waterfalls. You can also stop at the Rocky Gorge scenic area and walk over the footbridge to Falls Pond. There are many options for day hikes as well. You can check out Greeley Ponds and Sawyer Ponds or take a walk along Sabbaday Brook Trail to see the Sabbaday Falls. Acadia National Park Loop Road, Maine: Follow Route 3 around Acadia National Park on Mount Desert Island for some great scenery! Acadia National Park Loop Road is about 27 miles long and offers mountains, forests and ocean. Begin at the Hulls Cover Visitor Center and make stops at Sand Beach, Thunder Hole and Otter Cliffs for great views. Route 1, Maine: This route will take you along the southern Maine coast. Start out on Route 1 in Bath and follow Route 1 or Route 1A to Kennebunk. Heading north you will find low-lying sea marshes and foliage-covered hills. You can follow Route 1 from one historic town to the next, from York, Ogunquit, Wells and into Kennebunk. You can also take a detour onto Route 52 to see Megunticook Lake. Blackstone River Valley, Rhode Island: Here you will find a country road with farms and apple orchards. The Glocester Loop goes through the Blackstone River Valley beginning and ending on I-295. Take exit 7 off I-295 and travel west on Route 44. Pass through the town of Chepachet and continue to the village of West Glocester. You can then turn onto Route 94S and continue through North Foster. Route 94 ends at the intersection of Route 14 where you will take a left. Take Route 14 through Scituate, turn left onto Route 116 and travel north. At Route 44 turn right and return to I-295. Through this route you will find historic homes and mills and you'll feel like you've gone back to the nineteenth century. Historic Route 169, Connecticut: You can begin your drive on Route 169 in Lisbon and continue toward Woodstock. You can stop in Canterbury to visit the Prudence Crandall Museum or visit Pomfret to see the Lapsley Orchard for apple picking and end your break at the Sharpe Hill Vineyard and Winery. Once you make it to Woodstock, don't miss the Roseland Cottage, also known as the pink house, a National Historic Landmark from 1846. Old King's Highway, Massachusetts: Old King's Highway is Route 6A on Cape Cod. It winds from the Sagamore Bridge over the Cape Cod Canal and through the towns of Sandwich, Barnstable, Yarmouth Port, Dennis, Brewster and Orleans. The Highway is full of historical sites, antique stores and art galleries. You can see plenty of foliage along the narrow roads along with a view of the Cape Cod bay. For more leaf peeping ideas in New England and across the U.S., check out articles from USA Today and the Travel Channel.